This red-eye devil’s food cake has all the requisite ingredients of a hellacious chocolate cake: cocoa, sugar, dark chocolate, a ganache filling, and frosting. And there’s more—the addition of coffee gives the cake a jolt of caffeine and flavor. Where Did This Cake Get Its Name? According to author Bill Yosses, this riff on an American classic takes its name from the coffee in the batter. “Like the Red Eye coffee drink in espresso bars that’s punched up with an extra shot of espresso,” explains Yosses. 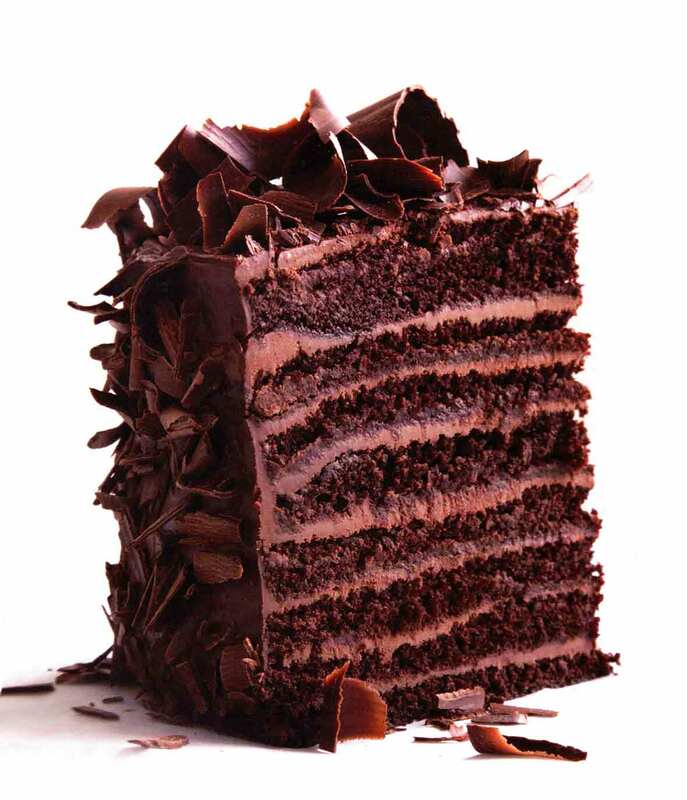 “Here, coffee gives the chocolate cake a lightly bitter edge that cuts the sweetness of the chocolate. The coffee-enhanced cocoa layers sandwich a surfeit of fudgy, bittersweet ganache. If this is not the ultimate birthday cake, I can’t imagine what is.” Or the ultimate cake for any occasion. Including no occasion other than a craving for chocolate cake. 1. Position a rack in the center of the oven. Preheat the oven to 350°F (176°C). Butter two 9-inch round cake pans with unsalted butter. Line the bottoms of the pans with parchment or waxed paper rounds and butter the rounds. 2. Sift the flour, baking soda, baking powder, and salt onto a piece of parchment or waxed paper. Set aside. 3. Place the cocoa in a small bowl and whisk in the coffee, a little at a time, until smooth. 4. In the bowl of an electric mixer fitted with the paddle attachment, cream the butter until fluffy, then beat in the sugar. Mix on high speed until very light and fluffy, 6 to 8 minutes. 5. Add half the flour mixture to the butter mixture and mix on low speed just until incorporated. Add the eggs, 1 at a time, beating to incorporate after each addition. Add the cocoa-coffee mixture and beat to incorporate. Add the remaining flour mixture and mix just until incorporated. 6. Divide the batter evenly between the 2 pans and bake on the center rack, turning the pans from back to front during the baking, until a cake tester inserted into the middle of the cakes comes out completely clean, about 45 minutes. 7. Let the cakes cool in the pans on racks for about 30 minutes. Slide a thin knife or offset spatula around the sides of the pans and turn them over to unmold the cakes onto the racks. Carefully peel the parchment or waxed paper rounds from the bottoms of the cakes and allow the cakes to cool completely, at least 30 to 40 minutes more. Cover and refrigerate the layers. This will make the cake less crumbly and easier to slice when cutting the layers. 8. While the cakes cool, place the chocolate in a heatproof bowl. 9. In a medium saucepan over medium-high heat, bring the cream to a boil. Pour the hot cream over the chocolate and let it sit for 3 minutes. Whisk until the cream and chocolate are thoroughly combined and smooth and slightly cooled. Cover tightly with plastic wrap and refrigerate for at least 4 hours. Once the ganache is chilled, whisk just until fluffy. 10. Using a long, serrated knife, cut each cake horizontally into 4 thin layers. To do this, place 1 hand flat on top of a cake. Slice into the cake about 1/2 inch from its top and use a sawing motion to slowly move the knife into the cake about 1 inch. Then, still slicing back and forth, turn the cake (counterclockwise if you are right-handed, clockwise if you are left-handed) on the table, going around the circumference of the cake but not cutting into its center. After the first full outer circle is complete, hold the knife level, dig into the cake another inch, and turn the cake again in the same direction. Repeat until you have sliced all the way through the cake. Carefully remove this top layer and repeat to obtain 4 layers from each of the 2 cakes. 11. Place 1 of the bottom cake layers on a serving platter and spread a thin layer of ganache over the top. Repeat with the rest of the layers. Use some of the remaining ganache to apply a very thin coat on the sides of the cake, giving it a “crumb coat” that seals in the crumbs and prevents them from appearing on the outside of the finished cake. Refrigerate the cake with its crumb coat for an hour, then slather the cake with the remaining ganache. 12. Finish by sprinkling the chocolate curls on the top of the cake and gently pressing them against the sides. Voila. This red eye devil’s food cake is delicious! I didn’t go through the work of making four layers and frosting them all, but the 2 cake layers were absolutely perfect. Not only was it dark, moist, and full of flavor, but the cake settled into flat layers—no slicing off the hump. It does take a bit of work, though, with the coffee/cocoa mix, then the creaming and mixing here and there, but the end result is worth it. You’ll never look at a devil’s food box mix again. The only problem I had was with the ganache: I couldn’t get it thick enough to spread or hold up to the weight of a layer of cake on top of it. Maybe too much cream? I ended up whipping it and it became mousse-like, but with just enough heft to frost the cake. The flavor was great, though. 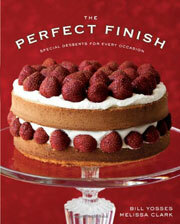 If you love chocolate, then you’ll love this red eye devil’s food cake. It’s moist and full of great chocolate flavor. Yes, it took time and was labor intensive. But it was so worth the work. It’s a delicious cake and my family loved it! Making the chocolate curls as suggested was also a bit of a problem: I tried with a vegetable peeler, and then with a cheese shaver, and nothing worked. Next time, I’ll go back to my old ways of making chocolate curls by melting and spreading a thin layer on waxed paper and then peeling it off in strips. I did have a problem with the ganache—it was a bit stiff. Red Eye Devil’s Food Cake Recipe © 2010 Bill Yosses. Photo © 2010 Marcus Nilsson. All rights reserved. All recipes and photos used with permission of the publisher.